Foam Cups Are Used For Applications Including Food Service, Hospitality, Commercial And More. Foam cups are made of foam for durability and dependability. Insulated cups maintain internal beverage temperature while allowing external handling comfort. Accommodates hot and cold beverages. One-piece construction provides leak resistance. Available types include Hot/Cold Beverage Cups and Hot/Cold Beverage Cups w/ Lids. Capacities range from 4 to 24 Oz. Package quantities range from 25 to 1000. Colors are Multicolor and White. Dimensions vary per model. 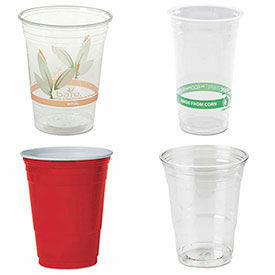 Plastic Cups Are Used For Applications Including Food Service, Hospitality, Residential And More. Plastic cups are made of plastic for durability and dependability. Cups are designed for cold beverages. Features a wide mouth for easy pouring and rolled rim for user comfort. Units are disposable. Available types include Cold Beverage Cups and Hot/Cold Beverage Cups. Capacities range from 2-3/8 to 24 Oz. Package quantities range from 25 to 2500. Colors are Multicolor, Red, Translucent and White. Dimensions vary per model. 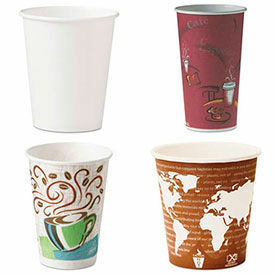 Paper Cups Are Used For Applications Including Food Service, Hospitality, Residential And More. 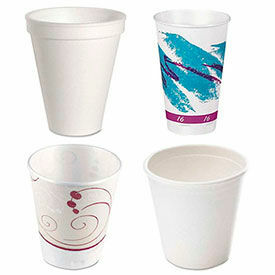 Paper cups are made of paper for durability and dependability. Cups accommodate hot and cold beverages. Wax coating prevents leaking and external condensation. Units are disposable. Capacities range from 3 to 20 Oz. Package quantities range from 25 to 5000. Colors are Brown, Dark Green, Gray, Green, Light Green, Maroon, Multicolor, Peach and more. Dimensions vary per model. 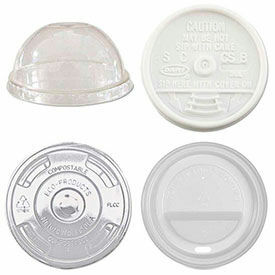 Lids Are Used For Applications Including Food Service, Hospitality, Retail And More. Lids are made of plastic for durability and dependability. Lids allow drinking access while preventing spillage for convenient transport and maintenance. Accommodates hot and cold beverages. Units are disposable. Capacities range from 3-1/4 - 9 Oz to 12 - 24 Oz. Package quantities range from 50 to 2500. Colors are Black, Translucent and White. Dimensions vary per model. Specialty Cups Are Used For Applications Including Medical, Commercial, Residential And More. Specialty cups are made of high quality materials for durability and dependability. Unit design prevents leaking and external condensation. Accommodates hot and cold beverages. Most units are disposable. 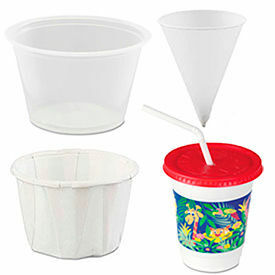 Available types include Catering Plastic Cups, Cold Beverage Cone Cups, Kids Cups w/ Straw/Lid, Mug and Portion Cups. Capacities range from 1 to 12 Oz. Package quantities range from 50 to 5000. Colors are Multicolor, Translucent and White. Dimensions vary per model. Konie KCI 4.0KR - Rolled-Rim Paper Cone Cups, 4 Oz., White, 5,000 Qty.